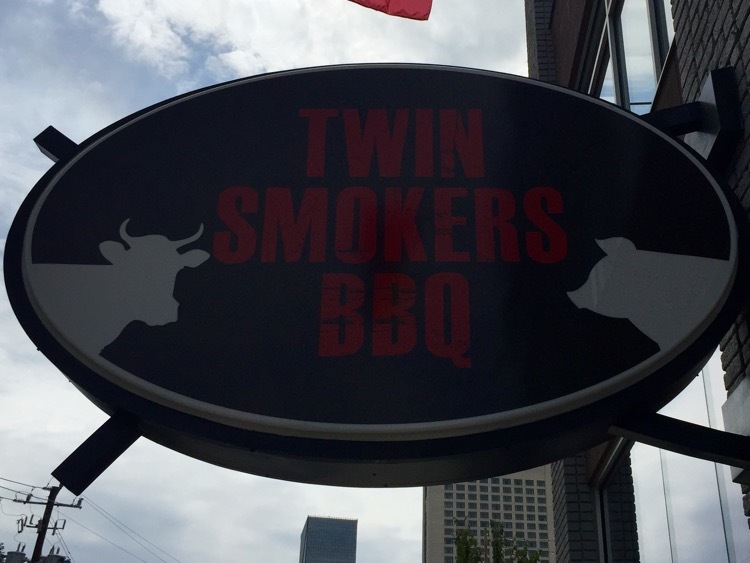 Twin Smokers BBQ opened last December on Marietta Street, near the Georgia Aquarium, but we had not had the chance to try them out yet. Today, as we headed to the airport for an afternoon flight, we ended up downtown, looking for food. As we drove down Marietta Street towards West Midtown, I saw their sign and pulled into the next parking lot that I saw. What I didn’t know was that parking at the Hilton Garden across the street is comped for three hours for the three restaurants in a row there – we found this out from the security guard in the lot we parked in. After I had just fed the meter. 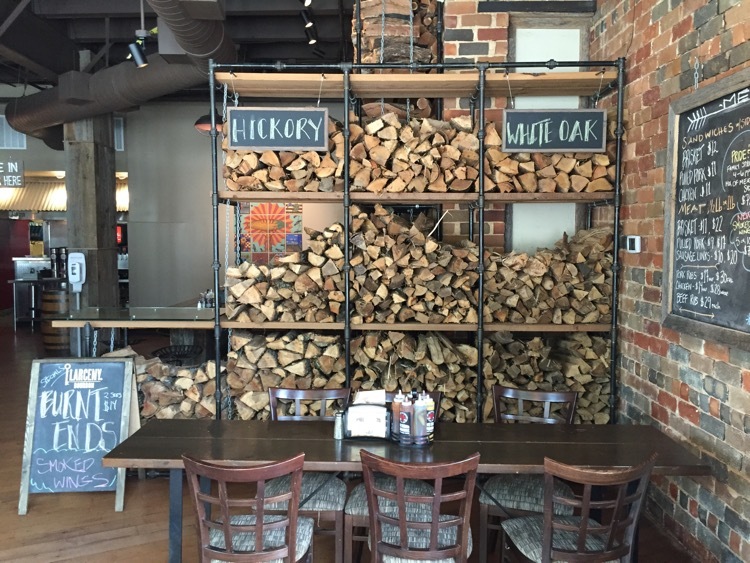 As we walked in, we were greeted by this wall of hickory and white oak (there’s another wall of Texas mesquite and post oak behind it) which feed the eponymous smokers. There was also a sign, about which I got very excited, that today’s special was burnt ends. Decisions made. 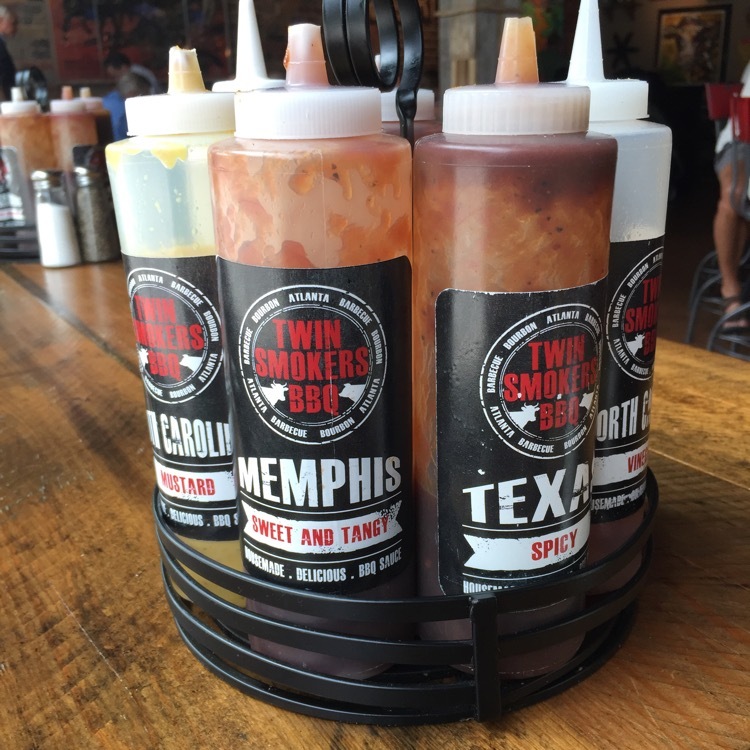 We walked up to the counter, ordered the burnt ends, and were told that those were yesterday’s special…. Crestfallen, I stared at the twin smokers and pondered. 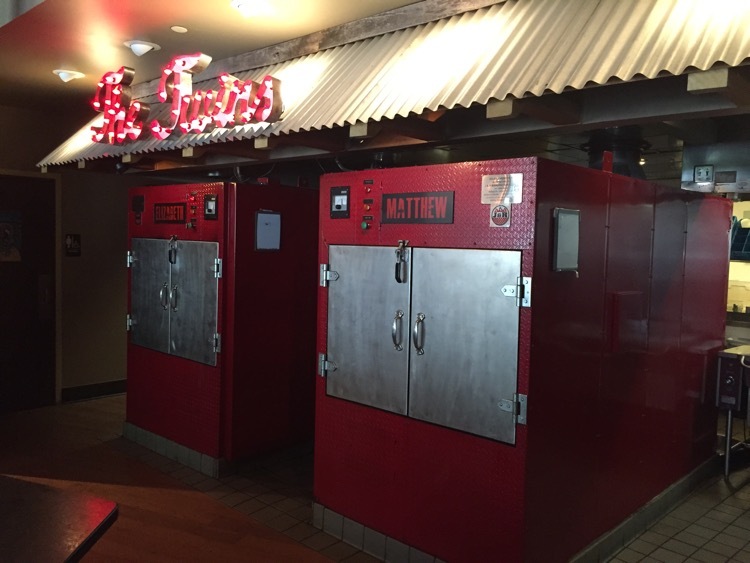 The twins, Matthew and Elizabeth, are used for different meats: they smoke pork and chicken in one (using hickory and white oak) and brisket and ribs in the other (using Texas mesquite and post oak). We ordered our meats and sides and took a seat at one of the long tables, which had tractor seat stools and waited. I took a taste tour of the sauces, while we waited. There were seven to choose from, four of which were some variation of a sweet sauce. Jo really liked the mustard sauce (almost all yellow mustard flavor, to me), while I preferred a mix of the sweet and tangy with the spicy. Jo ordered the brisket with slaw and cornbread, but they were out of cornbread for thirty minutes – they had burned the first batch of the day. She changed to mac-n-cheese. I ordered a combo plate with brisket and sausage, with mac-n-cheese and cook’s stew. The mac-n-cheese should have been called mac-n-green peppers, based on the dominant flavor. There was a little jalapeño bite, but the peppers way overpowered the cheese. The cook’s stew was very different, but good. It was thick and very tomato soup-like, but full of traditional stew components. According to the BBEEST, the slaw was very bland, although it looked very tasty. 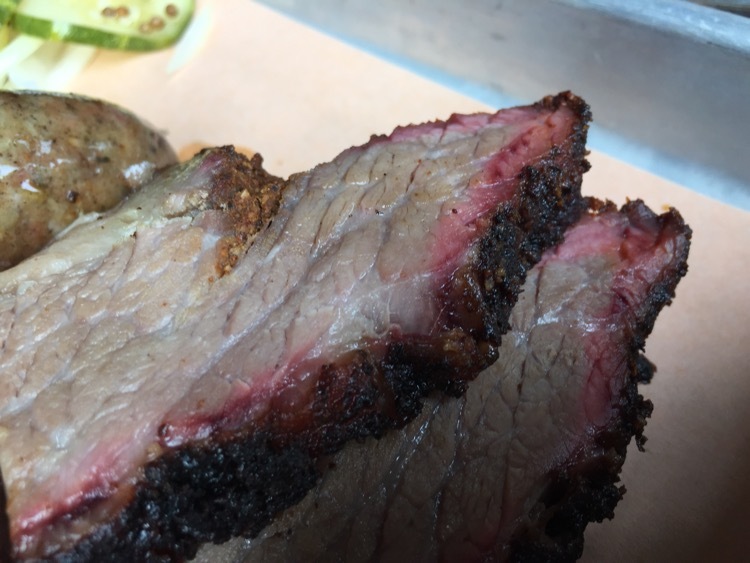 The brisket was good, with a nice smoky flavor and a good smoke ring, but it required a knife to cut and was on the dry side. The thick slice may have contributed to both of those attributes. We’ll have to go back on another day and try other meats and sides. 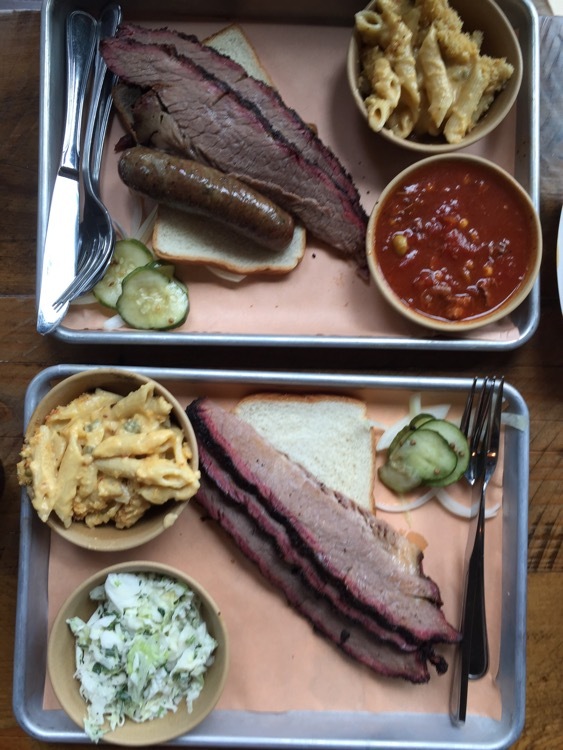 I liked the look of the place very much (extremely reminiscent of Pecan Lodge, looks-wise) and the service was good. That brisket looks lonely and sad. It was dry and definitely not fork tender.